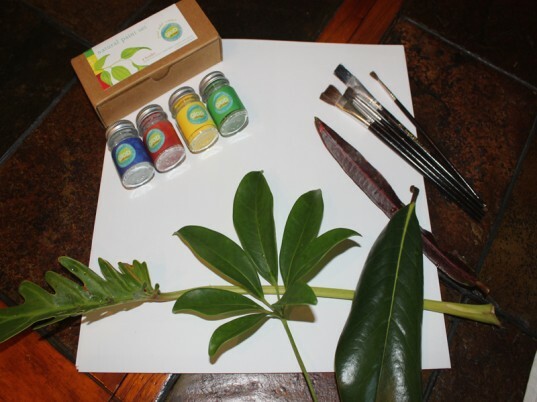 My son and I were super excited to receive a set of Glob Natural Paints to review. Glob is a natural art supply company with a focus on sustainability, using vibrant pigments that have been used throughout the ages by many different cultures. 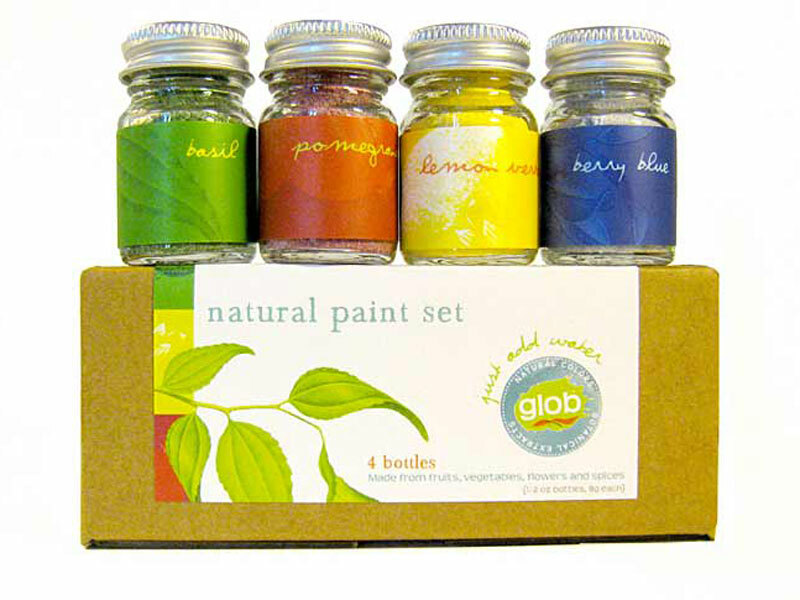 Glob's pigments are all natural, biodegradable and come in a beautiful collection of colors; Lemon Verbena (yellow), Blueberry (blue), Pomegranate (red), and Basil (green). 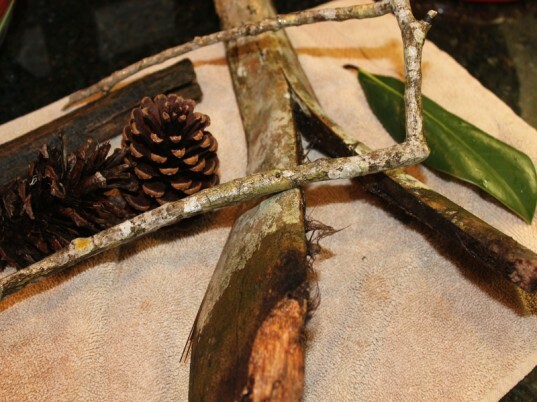 We couldn't wait to get our hands dirty, and after taking a nature walk around our neighborhood, we headed home with a small collection of leaves and the perfect project idea. Since Glob paints are made using flowers, vegetables, fruit and spices, with natural food grade ingredients and organic extracts, we decided that leaf prints would be the perfect nature inspired project to try with our Glob paints. Read on to learn how we used this fantastic new art medium to create a nature inspired art gallery for the wall. Any art project is more fun when you incorporate the great outdoors. Take your children for a walk around your neighborhood and backyard to collect leaves of different sizes and shapes. 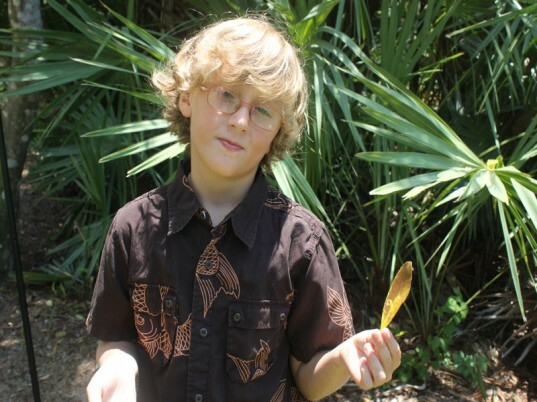 This is a great time to bond with your child and incorporate a little science and botany into your outside time. Use an old towel, tablecloth, drop-cloth or newspaper to prepare your workstation. 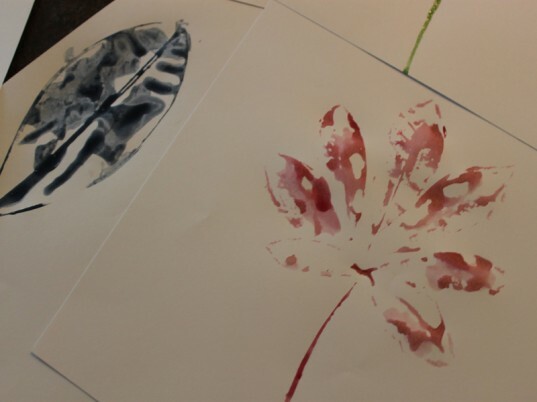 Collect all of the supplies that you will need to complete your leaf print art project. 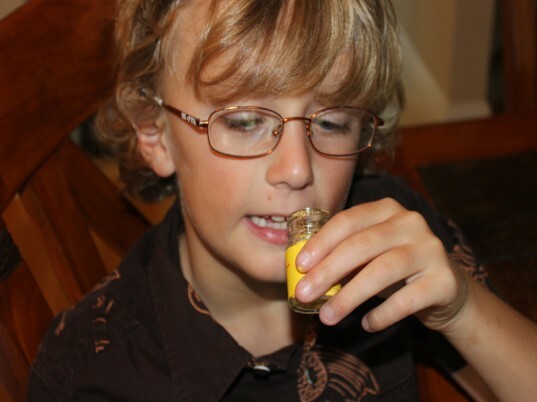 This the perfect time to let your child smell the Glob natural pigments, they smell wonderful – my son loved it! Using equal parts glob paint pigments and water, mix your colors. 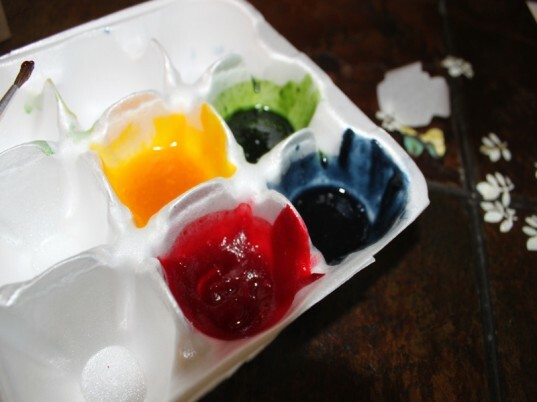 We used an empty egg carton that we found in the recycling bin as a paint palette. Give your little ones full creative control and let them use a paintbrush to paint a generous amount of Glob paint onto one side of a leave. The Glob natural paint is water based so the colors are beautiful – we added more pigment for a thicker consistency. 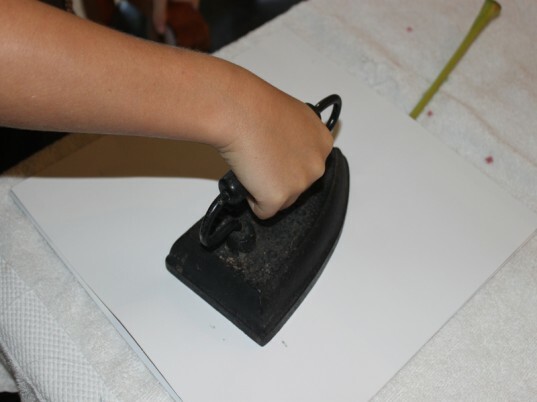 Place the leaf (paint side down) onto a piece of recycled white paper.Cover with another piece of paper and use something heavy like a large book (we used an antique iron) to press the leaf onto the paper for a couple of minutes. Carefully remove the heavy object and leaf from the paper. Your child will delight in seeing the colorful leaf image that transferred to the paper. Once the leaf prints have completely dried, use scissors to cut the paper to your desired size. 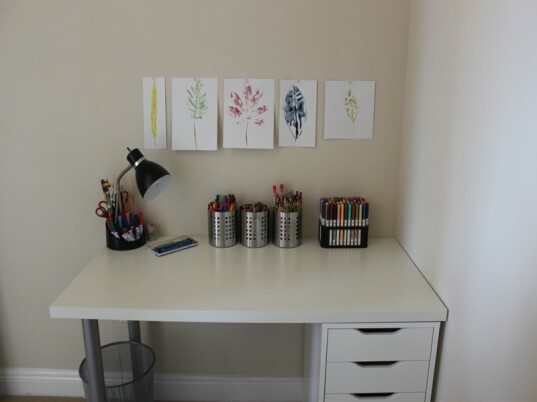 Using pushpins create a leaf art gallery anywhere in your home. We decided to hang our leaf prints above my son’s desk. You can also frame them or give them away as gifts. Use an old towel, tablecloth, drop-cloth or newspaper to prepare your workstation. 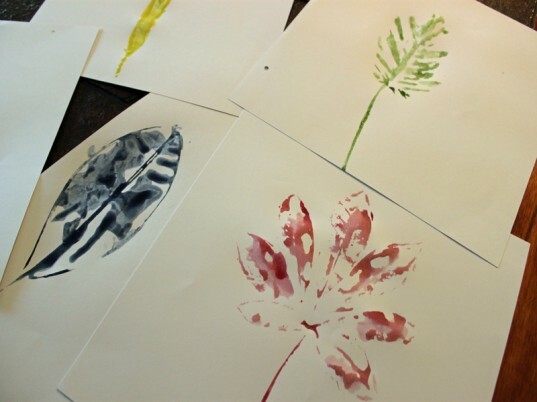 Collect all of the supplies that you will need to complete your leaf print art project. This the perfect time to let your child smell the Glob natural pigments, they smell wonderful - my son loved it! Give your little ones full creative control and let them use a paintbrush to paint a generous amount of Glob paint onto one side of a leave. The Glob natural paint is water based so the colors are beautiful - we added more pigment for a thicker consistency. 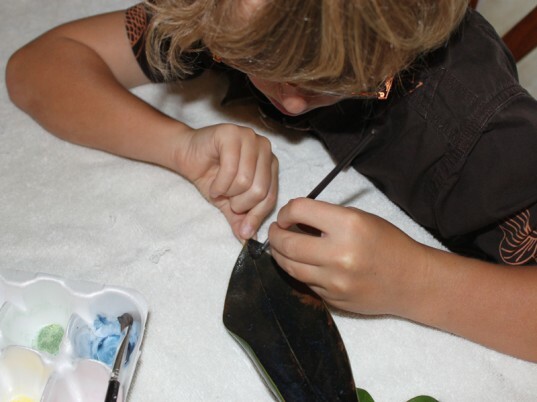 Place the leaf (paint side down) onto a piece of recycled white paper. Cover with another piece of paper and use something heavy like a large book (we used an antique iron) to press the leaf onto the paper for a couple of minutes. Using pushpins create a leaf art gallery anywhere in your home. We decided to hang our leaf prints above my son's desk. You can also frame them or give them away as gifts.